J2EE stands for Java 2 Platform, Enterprise Edition (J2EE). The J2EE is a platform popularly used for building server-side applications and provides a convenient component-based approach. J2EE is also used to develop Enterprise applications. Enterprise applications are software applications that facilitate various activities in an enterprise. In short, Enterprise applications are ones, which helps an enterprise to manage its various business activities. A programming model that comprises a set of Application Programming Interfaces (API) and approaches to building applications. An applications infrastructure, to provide support for the Enterprise application built by using API. Client-tier consists of a web component such as Servlet, JSP, or java standalone application. This tier consists of the program that interacts with the user. It provides dynamic interfaces to middle-tier. Middle-tier is also known as the server-tier. In the middle tier enterprise bean and the web services encapsulates distributable business logic for the application. Enterprise data tier is the database tier in which enterprise level data stored and persists in a relational database. The J2EE Technologies can be divided as per their use. These technologies are an important part of the application as it holds the business logic. There are three types of components ie. 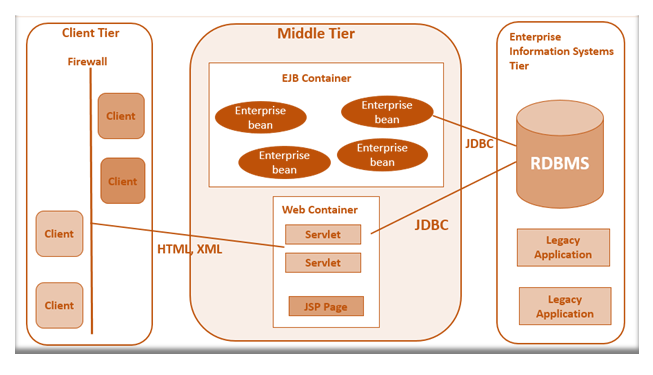 JSP Page, Servlets, and Enterprise JavaBeans. These technologies help the components of applications with support services to function efficiently. These technologies provide the mechanism for communication between different parts of applications irrespective of their location. These technologies are most transparent in nature to the application programmer. J2EE is Platform independent that may be spread across many different platforms. Such kind of platform-independent programming model also reduces the difficulties encountered by integrating many of the different technologies that are specific to certain platforms and applications. In the programming field, the code reusability is very important. Java is an object-oriented language and it provides the mechanism of reuse. We can reuse the code to use the object orientation to encapsulates shared functionality. When we develop a complete server-side application, the server-side applications are large and complex. We can break down the large and complex application into various modules that are individually responsible for a specific task. It will make the application much easier to maintain and understand.